This new feature of the Linksys Business Cloud Access Points allows you to remotely manage multiple access points, networks, and businesses anytime and anywhere. The Linksys Cloud Manager is enabled by default on your access point. However, you will need to set up a Cloud account to be able to use the Linksys Cloud Manager. To know how, click here. This allows you to manually configure the advance features of your Linksys Business Cloud Access Points. The local interface has configuration limitations when the Linksys Cloud Manager is enabled. Therefore, if you need to use the advance features of your Linksys Business Cloud Access Points, you can turn OFF the Linksys Cloud Manager and then access using the local interface. NOTE: Disabling or enabling the Linksys Cloud Manager will reset the settings of your access points and you will need to reconfigure it. To learn more, click here. System Status tab – contains read-only information about your access point such as LAN Status, Wireless Status, Wireless Clients, Statistics and Log View. Diagnostics tab – allows you to Ping test your connection and shows you the Diagnostic Log. The Configuration tab is not available. Basic settings can be configured in the Linksys Cloud Manager such as LAN / Wi-Fi settings, Captive Portal (known as Splash page), time zone, light indicator settings and accounts. ​NOTE: The Linksys Cloud Manager only supports Open and WPA2™ encryption. Basic LAN settings are available in the local interface even when the Linksys Cloud Manager is enabled. The Cluster, WDS, Workgroup Bridge features and any advanced settings are not supported when the Linksys Cloud Manager is enabled. Manual firmware upgrade is not available in the local interface when the Linksys Cloud Manager is enabled. To learn how to upgrade your access point's firmware through the local interface, click here. Config file is not supported. Use the reset button to restore your access point to its factory defaults. 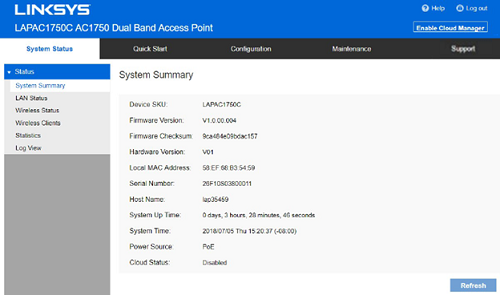 Reboot your access point through the Linksys Cloud Manager or power cycle your access point. 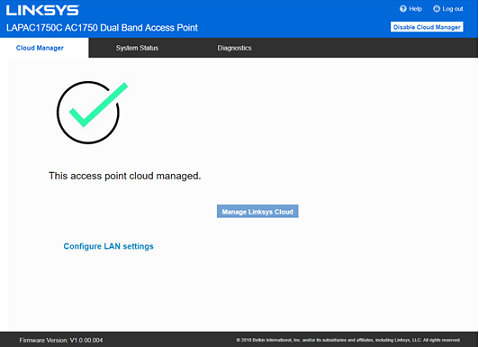 When the Linksys Cloud Manager is disabled, you can manually configure the settings of your access point.